How do you go from Hot Rod magazines and underground comix to the 2010 Whitney Biennial? Essentially, Robert Williams just let the rest of the world catch up with him. Frankly, his psychedelic cars and naked ladies are probably more aesthetically conservative than the rest of the Whitney event. Of course, Williams was not there to see it. He had his own show at Cal State Northridge, drawing a more Williams-esque crowd. 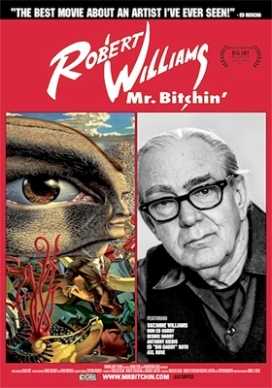 Mary C. Reese surveys the artist’s life and work in Robert Williams: Mr. Bitchin’ (trailer here), which releases today on DVD and VOD platforms. Williams did not look like much of a car guy when Ed “Big Daddy” Roth hired as the art director for his magazine and t-shirt business, but he had a naturally affinity for the company’s Rat Fink character. Eventually, Williams’ work became too out there for Roth, but it was perfect for ZAP Comix. Yet, Williams always considered himself a painter first and foremost. Williams work has an almost baroque level of detail that is quite impressive. Nonetheless, his choice of subject matter often generates controversy. In the past, feminists have objected to his depictions of scantily clad (or outright naked) women lounging on giant enchiladas. Guns N’ Roses got an earful of such sentiments when they used his painting Appetite for Destruction on what became their CD of the same name. While their label initially moved Williams’ love-it-or-hate painting to the inside flap, the band has since moved it back, without anyone seeming to notice. While Williams largely defined the look of the 1960’s (especially for those who held to the notion that reading naughty comics was a political act in and of itself), neither he nor Reese (and her battery of co-directors) get terribly sidetracked by political discussions in Bitchin.’ Instead, we watch the artist’s old school canvas-stretching, which is a rather telling moment. He also is clearly devoted to his longtime wife Suzanne, who also happens to be both an artist and a hotrod enthusiast, as well. Who would have thought the late, great Artie Shaw of “Begin the Beguine” fame was a Williams collector, but he indeed turns up here, perfectly willing to discuss the painter’s work in an extended interview segment. Reese also talks to other colleagues and fans, such as Slash, Axel Rose, Deborah Harry, Don Ed Hardy, and Williams’ gallerist, Tony Shafrazi. Even if the not-so-counter-culture-anymore is not your cup of tea, it is fascinating to hear Williams dissect his large scale work, such as his portrait of the high-living King Farouk, A Life of Delusion. Reese never really challenges the artist to take stock of the unintended consequences of the era that made his reputation, which is hardly unexpected, but still leaves a conspicuous hole in the film. Still, Reese gives the audience a good sense of Williams’ personality and oeuvre. Recommended for the artists’ fans, Robert Williams: Mr. Bitchin’ is now available on Cinema Libre’s home viewing platforms and screens tonight (7/30) at the American Cinematheque’s Egyptian Theater in Los Angeles.